Are you planning on studying a new language? 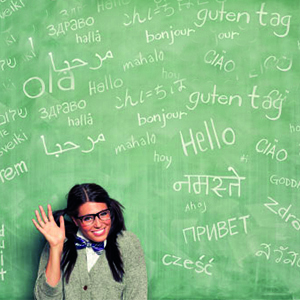 A study states that the students who tend to be multilingual tend to boost their overall cognitive development, and these students are more creative and have better self-esteem. This means that you can have the advantage to stand out and be the better fit in the modern world. As this globalized world expects the students with bilingual abilities and if they are learning a new language it will benefit the students who are pursuing their career overseas. Most of the researchers claim that the students who are learning more than one language tend to boost their brain power - a mental "work out" that fine-tunes the mind. When you learn a new language your brain tends to cope with complexity as they have to absorb new patterns. The students tend to develop key learning skills like cognitive thinking and problem-solving methods. They also develop critical thinking skills which are a significant benefit both personally and professionally for the students. The fact is that the learning two or more languages will make their brain to switch back and forth making them be more attuned to auditory information. When you are learning a language, it gives your brain a good work out. This means that multilingual people have brains that are more exercised and quick to recall names, directions, facts, and figures. A research study states that the students who study a foreign language perform better on standardized tests than their monolingual peers. As a result of their language studies, students have been able to score better in a Verbal test, math, and English reading scores. Multitasking comes more naturally to the people who are multilingual. The students who are multilingual and proficient at slipping from one language system to another tend to keep your brain to deal with two or more things simultaneously. If you develop the ability to think in different languages and move from one to the other makes you a better multi-taskers, reducing stress levels. Only multilingual has the ability to be good observers of their surroundings. As those students can easily spot anything that is irrelevant or deceptive. Most importantly, they are also better at spotting misleading information. A study states that when comparing multilingual and monolingual subjects, the former notably had the edge. A research study states that the monolingual adults will tend to get dementia at 71 years of age whereas the multilingual people tend to get it after 75 years. The major reasons are that the multilingual keep their brain healthy and active. The study also states that the learning new languages will make the person more rational and favorable decision makers. Most of the bilingual people learn a new language as they try to relate the fundamentals of their own native language with the new one. For instance, vocabulary, grammar, conjugation, comprehension, idioms, and sentence structure can be related to one’s native language making them become expert in their native language and also the new one. Also, learning a new language makes a person a better listener as they have to interpret meaning and judge nuances. When learning a new language, you increase academic performance and also it allows you to open up to new cultures making you be more flexible and appreciative of other people’s opinions and actions. Most of the multilingual tend to have a different perspective in viewing the world as they enhance their ability to communicate in today’s globally connected world. When people tend to learn the new language, they also learn about the historical and cultural habits in that society. The students who tend to be multilingual are in the process of evaluating their own ways of thinking and viewing the world. Most of the students who tend to learn new language develop an appreciation for themselves and those who are different from them. At the pace where the globalization is at the peak, it is not good for the students to remain monolinguals. Most of the organizations ask the students to understand other languages and culture. In addition, with the increase of immigration taking place globally, the students who choose to migrate from one place to another for job prospects, get benefitted if they adapt themselves to be bilingual.